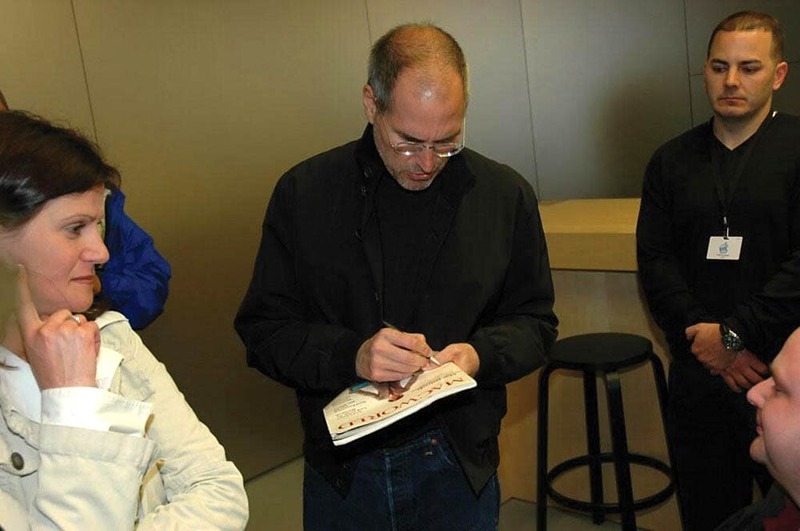 Not everyone gets Steve Jobs to give an autograph. A piece of a well-known story about Steve Jobs’ disdain for giving autographs goes on the auction block Thursday. At the 2006 opening of an Apple Store in New York City, the Apple co-founder initially refused the request of a man in a wheelchair who had hoped Jobs would sign his copy of the premiere issue of Macworld magazine. RR Auction, which has auctioned off eight other Jobs’ autographs since 2012, estimates the signed magazine, which includes photographic proof of authenticity, will fetch at least $10,000. 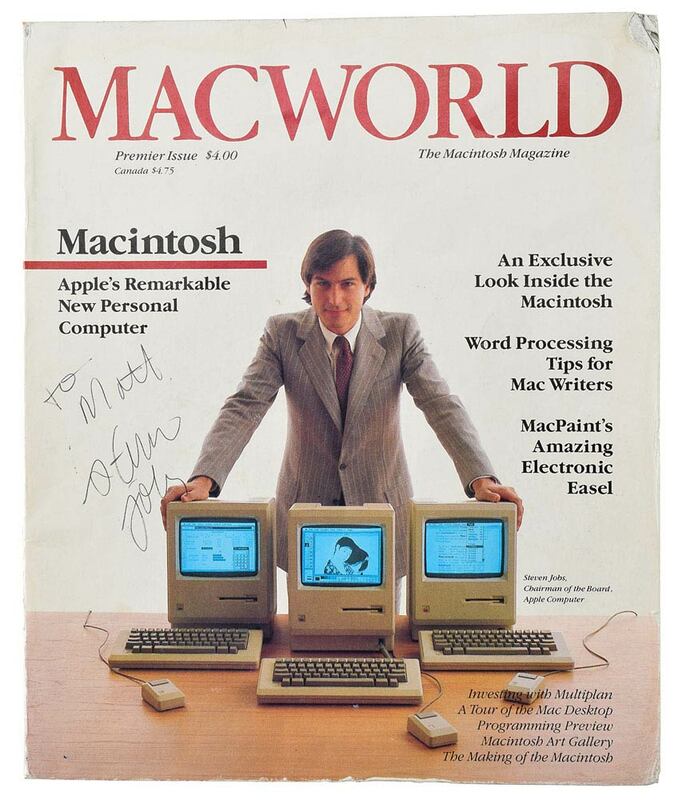 The first issue of Macworld signed by “steven jobs” is a dream for Apple collectors. Ten grand may be a bargain if you go by the 2018 Paul Fraser Collectibles Autograph Index, which tracks the value of famous signatures. It lists the rare autograph of Jobs as most valuable. His signature, according to the index, has been the best-performing autograph since 2000. Samples of Jobs’ signature have gone up in value by more than 27 percent over the last 18 years. It’s worth a little more than $50,000, according to the index. The value varies widely depending on the item signed and whether there’s a buyer willing to drain their bank account. RR auctioned a business card signed by Jobs for $5,600 in 2012. Earlier this year, a job application signed in Jobs’ hand sold for $174,757. In a blog post on the RR Auction website, consignment director Tricia Eaton described Jobs’ signature as surprisingly demure for a formidable leader. “When we think Jobs, many picture a strong leader, forging his way through Silicon Valley and would half expect a signature full of sharply drawn capitalized block letters,” Eaton wrote. “On par with his boundless imagination, the computer giant had a whimsical signature accomplished in an odd lowercase cursive fashion all his own. The highest bidder in this month’s auction will own a double rarity. The first Macworld, which features Jobs on the cover with three Macintosh computers, is highly coveted by tech collectors. And of course, Jobs autograph, which he rarely gave. The Macworld signature also comes with letters from Beckett Authentication Services, which collectors and auction houses use to verify autographs. The auction ends Dec. 13.